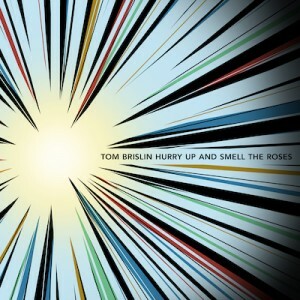 Keyboardist, vocalist, and songwriter Tom Brislin, known for his work with notable artists spanning a variety of genres and generations, releases his debut solo album, Hurry Up and Smell the Roses on Tuesday, October 30, 2012. Brislin’s piano-driven music is described as “Cinematic Pop”, and is flanked by orchestral and electronic flavors throughout Hurry Up and Smell the Roses. The album features 11 original tracks, including “Your Favorite Day” and “Stuff You Would Understand”. A New Jersey native, Brislin embarked on a musical path as both a songwriting artist and session keyboardist. He gained visibility through a string of demanding tours with iconic artists including Meat Loaf, Yes, Debbie Harry, and many others. “It was a thrill to play music with these artists I grew up hearing,” said Brislin. “Even though my own music is something quite different, it was an education like no other.” Brislin has drawn comparisons to vocalists including Sufjan Stevens, Gotye, Elliot Smith, and Ben Folds. Brislin wrote, produced, performed and recorded Hurry Up and Smell the Roses independently. The album features guest contributions from guitarist and platinum songwriter Clint Lagerberg, vocalist Annie Haslam of Renaissance, and Theremin synthesist Shueh-li Ong. The release was made possible with the help of direct fan-funding through Kickstarter.com. Fans offered pledges in exchange for a variety of rewards including house concerts, limited-edition merchandise, and customized recordings of cover songs by request. Brislin’s songwriting first emerged in the synth-rock band Spiraling, who toured with groups including They Might Be Giants and OK Go. Following the group’s breakup, Tom relocated to Nashville, Tennessee, to write and record for the first time as a solo artist. Brislin will showcase material from Hurry Up and Smell the Roses in Nashville and New York starting in November. Plans for a national tour will be announced in the coming weeks.